A cruise around Fiordland last year introduced us to places that were little different from how they would have been when the Maori and later Captain Cook first saw them. Although they looked similar, they were quieter without the birdsong that would have greeted those early visitors. Hunters and introduced predators wiped out many of the birds but thanks to the dedicated work of Department of Conservation staff and volunteers, breeding programmes and predator control are slowly, repopulating the bush, at least on some of the islands. Further north, a recovery programme has established a sustainable population of whio, the blue duck which adorns our $10 note. Today I’m grateful for the people who work so hard to bring back the native birds from the brink of extinction. Federated Farmers Dairy Industry Group Chair, Andrew Hoggard, said it had been a fairly unfavourable year for farming all round, especially in the dairy industry, with returns down 40 per cent. . .
Hawke’s Bay farmers are getting in behind a New Zealand first environmental restoration project, which has just been launched in Napier. The Cape to City project is a world-leading programme, which will aim to achieve a predator free Hawke’s Bay. It will focus on ultra low-cost, large-scale predator control across 26,000 ha of farmland between Waimarama and Havelock North with the aim to restore native species and plants and add value for farm businesses. The project represents a significant investment over five years for both Cape to City, and sister project Poutiri Ao ō Tāne, of more than $6 million and is a collaborative partnership between Hawke’s Bay Regional Council, the Department of Conservation, Landcare Research, Cape Sanctuary and the Aotearoa Foundation as well as private business and other Crown Research Institutes. . . Launching world–first Mibu® yarn blended from wool and rice straw. “Transforming industrial and agricultural waste into beautiful fabrics” is the mantra of New Zealand company The Formary. Back in 2010, they made global headlines when they collaborated with Starbucks and developed WoJo®, an award–winning fabric combining New Zealand wool with coffee sack waste fibre. On May 1st they launch their latest innovation, Mibu yarn, on the biggest stage on the planet: the World Exposition 2015 in Milan. . . 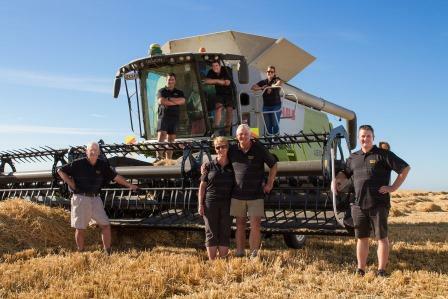 The Exclusive Grain Group has confirmed Timaru farmers Warren and Joy Darling are now the Guinness World Records® (GWR) holders for the highest barley yield. The world record attempt took place on Friday 23 January 2015 and was ratified by GWR on Wednesday 15 April 2015 with a yield of 13.8 metric tonnes per hectare with the Blackman Agriculture bred variety 776. Lincoln University has strengthened its ties with business in India after signing Memoranda of Understanding with ETI Dynamics and JCurve Ventures which emphasise the development ‘smart cities’. The agreements come after a recent visit by an Indian trade delegation to the University, which was hosted by Vice-Chancellor Dr Andrew West, Deputy Vice-Chancellor International and Business Development Jeremy Baker, and Peter Barrowclough, Chief Executive Officer of Lincoln Agritech Ltd, a 100 per cent owned subsidiary of Lincoln University. . .
A prosperous season among New Zealand’s juvenile ranks has brought New Zealand Bloodstock’s National Weanling, Broodmare & Mixed Bloodstock to the fore ready for the next crop of youngsters to be sold at the upcoming Sale in May. This year’s $1m Karaka Million winner Hardline (NZ (Showcasing) is a star graduate of the 2013 National Weanling Sale. Purchased by Hallmark Stud for $43,000 from Haunui Stud’s draft, Hardline returned at the 2014 Karaka Select Sale where Australian trainer Liam Birchley secured him for $130,000. . .
Federated Farmers Otago president says children on four-wheeled bikes are a reality of rural life despite damning statistics and some calling for a ban. A report released yesterday said off-road vehicle accidents accounted for the second-highest number of recreational deaths of children, behind only swimming and other water activities. The findings focused on four-wheeled bikes, which accounted for more than a third of the deaths, and highlighted children’s vulnerability when using vehicles designed for adults. Federated Farmers Otago president Stephen Korteweg said the statistics were ”pretty alarming”, but the practicalities of farm life meant children would continue to drive off-road vehicles, and particularly four-wheeled bikes. . . According to Safekids Aotearoa, 30 children die or are hospitalised every year as a result of quad bike injuries. . .
Conservation Minister Maggie Barry has welcomed an innovative partnership to dramatically transform the way invasive predators are managed on mainland New Zealand. The NEXT Foundation has partnered with philanthropists Gareth Morgan and Sam Morgan, and the Department of Conservation, to set up the Zero Invasive Predators (ZIP) project. All parties are contributing funding to the venture, with DOC providing $500,000 per year for an initial three years. The ZIP project will focus on developing the tools and systems needed to permanently remove introduced predators from large areas of mainland New Zealand. . . .
Record per-hectare returns for Green and Organic Green are forecast this season as a combination of supply constraint, favourable market conditions and strong end-of-season sales leads to increased Zespri grower returns across all categories. Per-hectare returns for Green growers are forecast at $52,987 and Organic Green at $42,207. Zespri Chief Executive Lain Jager says these returns are the result of great work from growers, the post-harvest sector, the Zespri team onshore and in the markets, and our retail and trade partners. Mr Jager explains the overall result reflects some unique, one-off factors. “A shortage of supply of Green kiwifruit from Chile and constrained supply of Gold kiwifruit from New Zealand have supported pricing, while Zespri’s foreign exchange hedging policy has mitigated against the strong value of the New Zealand dollar.” . . .
“As if that’s not enough, the government’s recent Employment Law changes mean meat workers will face a tougher time settling collective agreements and earning a decent living. . .
New Zealand’s largest animal feed exporter and world-leading fibre nutrition company, Fiber Fresh Feeds, is celebrating 30 years in business by giving away nearly ten tonne of feed to horse riders at one of the country’s biggest equine events. As the naming right sponsor of the Fiber Fresh Taupo Christmas Classic from December 18-21, New Zealand’s second largest equestrian event behind Horse of the Year and the largest event by horse number in the Southern Hemisphere, Fiber Fresh is giving a free bag of feed to each of the 450 riders at the event. . .
Farmer AKA Mechanic, Agronomist, Engineer, Economist, Businessman, Accountant, Architect, Doctor, Manager, Electrician, Plumber, Veterinarian, Market Analyst, Meteorologist, Communicator, Teacher, Conservationist, Nutritionist, Carpenter, Biologist, Technician, Trucker, Maintenance worker, etc. When Rodger and Cindy Whitson decided to get into the cut flower industry back in 2000, they started with a bare paddock and no horticultural knowledge. They trialled gentians, viburnum and peonies before deciding peonies were best suited to their property, near Mosgiel. Peony plant numbers have since swelled from 2000 to about 10,000, with plans for more plantings. . .
North Otago’s most famous produce is being harvested for the new season. Rows of Jersey Benne potatoes are coming out of paddocks in the Totara area just south of Oamaru, renowned for the tarry, fertile soils that produce exceptional early spuds. A workforce boosted by tertiary and secondary students as they finish their exams is picking and packing the Jersey Bennes. Organic horticulturist Marty Quennell said his harvest started early this year – the week before Labour Weekend. That meant he had the market to himself for the first three weeks, when a premium price was being paid. With others growers now getting going, the price would drop back, he said. . .
(BusinessDesk) – New Zealand tractor sales are expected to match record highs for the modern farming era this year, as farming incomes are boosted by high milk prices and good growing conditions. Sales of tractors of at least 40 horsepower, the most common measure for farm tractors, have reached 2,536 in the first nine months of this year and are expected to climb by year’s end to match the 3,515 total for 2005, the highest level since the Tractor and Machinery Association began gathering the data in 1990. Some 60 percent of the nation’s farm tractor sales are estimated to relate to the dairy industry. Farmers had more cash this year to buy farm equipment such as tractors after Fonterra Cooperative Group paid out a record $8.40 per kilogram of milk solids and the agriculture sector generally benefited from good growing conditions which meant farmers could boost production without having to divert funds into areas such as extra stock feed. . . .
A group of prominent individuals and private businesses has joined forces with the Department of Conservation in a plan to eradicate all pests from mainland New Zealand. The Predator Free New Zealand Trust unveiled its vision of an Aotearoa free of rats, stoats and possums at the Place To Live conference in Whanganui today. Trust chairman Devon McLean said that the secret weapon in the battle against pests would be the thousands of New Zealanders already dedicated to controlling predators. Australia’s new trade agreement with China could give it an edge in milk powder exports unless New Zealand can invoke a clause in its own agreement to get similar tariff concessions. The two countries yesterday announced the end of ten years of talks for a free trade agreement which Australia says is superior to NZ’s 2008 deal which allowed for the full elimination of tariffs on dairy products by 2019. Australia’s deal allows for the elimination of tariffs on dairy products within eleven years, but crucially does not include the use of special safeguards by China to protect its farmers from surges of imported skim milk powder from Australia. . .
(BusinessDesk) – A2 Milk Co, the milk marketing company, is planning to list on the Australian stock exchange next year, where it has 9 percent of the fresh milk market sold in grocery stores. The Auckland-based company doesn’t plan to raise any new capital in a float on the ASX and will keep its New Zealand incorporation and NZX listing, it said in a statement. It has hired Goldman Sachs New Zealand and DLA Piper Australia to manage the listing, and hopes to join the Australian bourse in the first quarter of 2015. In August, managing director Geoffrey Babidge called the Australian market A2’s “big cash generator”, and said it will bankroll its push into new markets. The company reported annual sales rose 17 percent to $111 million in the year ended June 30, of which 96 percent came from Australian sales. A2 reported a drop in annual profit to $10,000 from $4.1 million a year earlier, as the strength of the kiwi dollar against its Australian counterpart weighed on sales. . .
Ballance Agri-Nutrients has joined forces with NIWA to bring advanced hi-resolution weather, climate and environmental forecasts to farmers via the co-operative’s Ag Hub online farm management system. Announcing the partnership, Ballance General Manager AgInformation Graeme Martin said farm profitability and sustainability are increasingly affected by variable weather patterns, growing conditions and the availability of water. “Farmers are looking for the best possible support to make operational decisions. NIWA’s advanced forecasting systems and its national climate station network are at the leading edge of weather and environmental information. . . The Department of Conservation has put a $10 bounty on great white butterflies for the school holidays to help eradicate the pest from the Nelson area, Conservation Minister Nick Smith announced. “We want great white butterflies dead not alive. They are an unwelcome pest and pose a major threat to endangered native cresses, and garden and commercial plants like cabbage and broccoli,” Dr Smith says. “To date they have only been found in Nelson Tasman but we must do everything we can to ensure they don’t become a permanent widespread pest. Female great white butterflies can lay as many as 750 eggs so every butterfly killed potentially stops up to another 750 butterflies emerging. “The peak period for the butterflies emerging from pupae this spring coincides with the school holidays. It’s a great opportunity to involve school children in conservation, as well as earning some extra pocket money. It also has the potential to help us curb a spring breeding surge. Butterflies should be put in a jar or sealed plastic bag and stored in the freezer so they don’t go mouldy until they can be dropped off to DOC’s Nelson office on weekdays between Monday 30 September and Friday 11 October. The bounty will not be available at other times and is only for adult butterflies. “Great white butterflies are mostly found in and around the Port Hills area of Nelson, but have been found as far out as Stoke and the Glen,” Dr Smith says. Country kids in years gone by earned good pocket money catching rabbits and bird pests. This is a great initiative to gainfully occupy children during the holidays, incentivise them to catch pests and do their bit for conservation.